The BBC sent a reporter to Stirling to watch Team GB prepare for the Paralympics. As he mentions, curling is the winter Olympic sport that captures the attention of the British public, and after the struggles of the GB Olympic teams, the pressure will be on the McCreadie rink, described as professional wheelchair curlers. In the video you can see them delivering from in front of the hack as opposed to near the hogline. WCF rules say that the stone at delivery played from between the hack and the top of the rings, must touch the centre line. Stones played between the top of the rings and the hogline can be up to (approx.) 6 inches from centre, the outer edge of the stone within 18 inches of the centre line. GB's McCreadie "quietly confident of gold"
You can read the rest of Bob's report HERE. Also a report from the Paisley Express. Though the GB team, all Scots, have as much experience and as many medals as any team in the world, for the past two years they've been undertaking what Tom Pendreigh their coach calls a "skill acquisition project." This has included throwing from the top of the rings rather than the near hogline. Pendreigh expressed surprise when I contacted him last week at the skepticism his project has provoked from those outside his program. He's certain of its advantages and feels his team has overcome "expected and managed" performance dips in the run up to the Paralympics. GB plays Canada in the first draw, and a good result will give McCreadie, who is still inexperienced at skip, all the confidence he needs to reach the podium. The Canadian Paraplegic Association of New Brunswick are working with the Fredericton Curling Club to introduce wheelchair curling to the province. 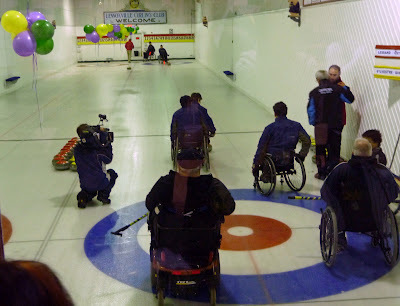 "Several of our clients said, 'What about wheelchair curling?' New Brunswick and P.E.I. 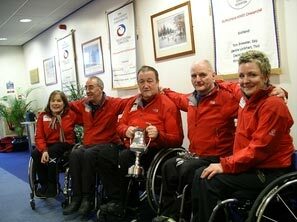 are the only provinces in Canada that haven't fielded wheelchair curling teams to the national championships. Our clients were saying it would be nice to formally introduce it in New Brunswick," the CPA's Haley Flaro told The Daily Gleaner. "When the Fredericton Curling Club moved into the coliseum, we now had a relatively accessible rink. That was an opportunity to try and get something going." 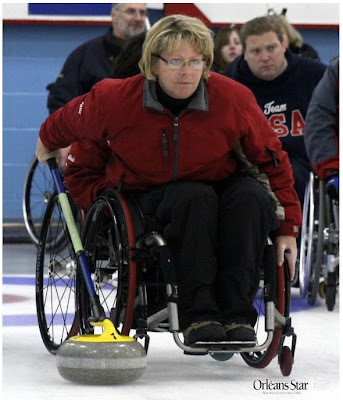 The give-it-a-go day is Saturday February 27 for both wheelchair users who want to try curling, and people interested in making that happen. Team Britain will demonstrate their sport at the East Kilbride Ice Rink, East Kilbride centre, on Wednesday 24 February, 12noon-1.00pm. Benoit Lessard skipped his Lennoxville CC team to a sweep of the challengers from the Victoria CC in Quebec City. He won the third match of the best of 5 series 11-4, settling down after going behind 4-0 on steals in the first two ends. The big end was again the downfall for Jean-François Sylvestre, who allowed a steal of 5 in the 4th. The Quebec champions round out the ten teams that will contest the Canadian Nationals in Kelowna BC, March 15-21. It will be their second appearance, after going a very respectable 3-6 in their rookie year. 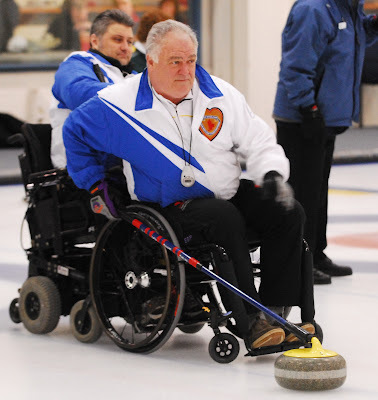 It was never a possibility that Team Canada would compete in a national championship prior to the Paralympics, though Jim Armstrong, before his latest injury, had told me he was open to competing in his provincial championship had not the Nationals been forced to schedule at the same time as the Paralympics. Ben Lessard led his Lennoxville CC rink to a 2 game lead in their best of 5 series against Jean-François Sylvestre of the Victoria CC in Quebec City. The Lennoxville team has only been curling for a couple of seasons, but that experience showed in comfortable 16-4 and 11-2 wins over the rookie visitors. "The difference for our team was in not giving up big ends," explained assistant coach Dan Janidlo. "The second game was close until we scored 4 in the 7th." Teams: Lennoxville - Benoit Lessard (skip), Carl Marquis (3rd), Denis Grenier (2nd) and Johanne Daly (lead) with Nicole Huberdeau (5th), coach Alfred Whittier assisted by Dan Janidlo. Victoria CC - Jean-François Sylvestre (skip), Michel Verreault (3rd), Allan Burridge (2nd), France Sévigny (lead) with Maxime Aubé (5th), and coachesJacques Palasse, Pierre Morneau and Jacques Deschênes. Bruce Cameron's rink curling out of the RA Curling Club brought Ottawa its first provincial title when he beat three time champion Chris Rees from Toronto 8-3 in the final of the Dominion Ontario Championship. Cameron lost his third to surgery just before the event but steered his side back from a 3-1 deficit after 2 ends to post four steals in an 8-3 victory. His win doubles the number of rookies (8 excluding alternates) slated to appear at the Nationals in Kelowna BC, March 15-21, with the final team, Quebec, to be decided tomorrow. 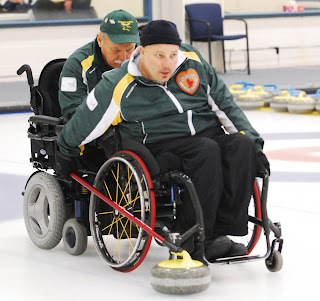 Wheelchair curling in Quebec began at the Lennoxville CC where Al Whittier, assisted by Daniel Janidlo moulded a group of established athletes accomplished in other disciplines into a team that represented their province for the first time in 2009. This year a late challenge from Qubec City has meant that there will be a Quebec provincial championship with the winner earning their passage to the 2010 Nationals in Kelowna March 15-21. The best of five matches series is scheduled for this weekend in Lennoxville. Games times are Saturday February 20, 1pm and 4pm, and Sunday 21st at 9am and if necessary noon and 3pm. 3-time Ontario champion Chris Rees (Toronto) booked his place in the final of the 2010 Dominion Ontario Provincials by beating defending champion Ken Gregory (Bradford) 10-1 in the semi-final. Gregory, who had relied on a last end 4 in the morning's last round robin draw to squeak into afternoon play, had no answer for Rees, who took 2 in the first and then stole to 9-0 lead after 5 ends. The Rees rink, with Carl Bax (3rd) Dal Wrigley (2nd) and Shauna Petrie will hope to revenge an extra end round robin defeat, when they meet Ottawa's Bruce Cameron in Saturday morning's final - 10.30 am at the Collingwood CC. The semi-final loss will disappoint a team that had travelled to Utica for the US Open (as did Bruce Cameron) to gain competition experience. Frank Cannarella (3rd) will also lose his record of appearing in every national championship, an achievement he shared with 2010 Team BC skip Whitney Warren. For most of the game it looked like defending Ontario champion Ken Gregory would become entangled in a three-way tie of 1-3 teams for third place in the Dominion Ontario Provincials at the Collingwood CC this morning. Down 5-3 after 6, he gave up a steal in 7 but then posted 4 in the final end to give Ottawa's Bruce Cameron his first defeat 7-6. He closed with a 2-2 record, good enough for this afternoon's 2 vs 3 semi-final against Toronto's Chris Rees who beat Richard Fraser 9-4 to finish 3-1. Cameron (3-1) went straight through to Saturday's final having stolen a 9-8 win over Rees in round robin play. Team Canada have their final training camp this weekend at the Richmond CC. Their last tournament game was in December, but they have brought invitees like Alberta's Jack Smart and Manitoba's Chris Sobkowicz into camp to play alongside Jackie Roy and Bruno Yizek for practice sessions. Last weekend they won 2 of 3 three matches against Whitney Warren's Team BC. This weekend I am told the Richmond CC has arranged games for Friday and Saturday though I do not have details. The team will attend Friday evening's Olympic women's draw. Team Canada is very excited about the upcoming Paralympic Games in our home country! We do not feel pressure to compete in Canada, we welcome that opportunity as a rare privilege! 'Home field advantage' for us, will be having family and friends to share this experience with...to celebrate the wins, have comfort after losses and live support in the stands. Team Canada has been focused on team building, refining strategies, enhancing communication skills and technical tweaking for the last 2 months. We have had several practice games at our 2 January camps and our final camp this weekend, in Richmond, will focus on final details of competition and event readiness. We recognize the presence of expectations...that is the reality of sport at the highest level. The roster of countries and players competing in 2010 is one of experience, talent, and this 2010 field is very level. Team Canada is healthy, anxious to play and most eager to put the Maple Leaf on our backs! Our primary goal is make the playoff round. Our focus however is one game at a time. We look forward to cheering on our Ladies and Men's Olympic teams this week in Vancouver. I also had a lengthy and less general conversation with Coach Rea that I will use in a future post. Newfoundland and Labrador's skip Joanne MacDonald (centre) with 3rd Darlene Jackman watched by Nova Scotia skip Mike Fitzgerald (left) and 3rd Laughie Rutt. The teams played a series of four exhibition games at the Halifax CC last weekend, with the hosts taking 2 of the tight first 3 games before closing easy winners of game 4. Bruce Cameron's Ottawa rink rolled to a third victory on Day 2 of the Dominion Ontario Provincials at the Collingwood CC. beating Tpronto's Chris Rees 9-8 on a steal in an extra end. At 3-0 he is assured of a first place finish in the 5 team round robin, and will go straight through to the final. Bradbury's defending champion Gregory lost to 2008 champion Rees 7-5 in the morning draw but registered his first win in the afternoon, beating Iderton's Claus 11-3. Claus beat Ottawa's Fraser in the other morning game; his team's first ever competitive win. Cameron plays Gregory in the final round robin draw with Gregory needing a win to assure at least a tie-break. If Rees beats Fraser he'll go into the 2 vs 3 semi-final. If Fraser and Gregory win tomorrow, there will be a three way tie for second. If Cameron and Rees win there's a 3 way tie for third. If Rees and Gregory win they'll face off again in the semi-final. Cameron's rink suffered a blow when their third, Doug Morris. underwent a scheduled back surgery yesterday. Jamie Eddy moved from second, replaced by rookie Andre Beaudin, who has been practicing with Team Cameron all season. Eddy is in his fourth season of curling and the second on Team Cameron. He represented Canada at sledge hockey in the Lillihammer and Nagano Paralympics. He is legally blind and uses binoculars and a CCA approved guide light to assist his accuracy. Defending champion Ken Gregory lost his opening draw to Fraser 10-9, after going behind by 6 after two ends. Fraser took 2 with hammer in the eighth for the victory. In the day's other game, Toronto's Chris Rees, the 2008 champion, beat Claus 13-2. Want the definitive word on Jim Armstrong's injury status? The message is the same as already described on the blog, but here it is, as requested, from Jim himself. Thanks for inquiring about my health again. As we had discussed a few weeks ago, I certainly did aggravate my surgerized left shoulder. Ironically, I strained it lifting a box, because the shoulder was actually feeling good enough, I actually forgot to be as careful as I should. I had it medically assessed, and, given the time frame, further surgical repair, even if needed, would be impractical, and would certainly have taken me out of the Paralympics. Fortunately, our Program now has on staff a tremendous physiotherapist, Paige Larson. Paige has huge professional experience providing treatment for Team Canada at a number of Olympic and Paralympic Games. I have been getting treatment regularly, every two or three days, and I am certainly improving week to week. As you have indicated, I am struggling with everyday mobility, but it is now more of an inconvenience than a threat to my ability to play. I know it still looks worse than it is, since my neck tends to accommodate for the shoulder tenderness, and I am now dealing with neck stiffness. The entire team and staff are ready to rock, and it would take a gun to keep me out of the line-up now! All the best, and keep up the good work, Eric. When I mentioned Jim's health to national team coach Joe Rae earlier today, he said; "I'll shoot him if I catch him lifting heavy boxes again before the Paralympics." Had the team prepared for the possibility of Jim's absence? "We have prepared for all eventualities, for the absence of any of our players. And no, I'm not going to say what those plans are." If I were Joe, neither would I.
Katie Paialunga, who plays second on Ken Gregory's Bradford based Ontario championship team, admits to looking beyond 2010, to the 2011 Nationals where she hopes the winner will be declared Team Canada, breaking the current selection process. The next goal for the Gregory rink is to win a national title in 2011, which would then lead to an appearance in the world championships. 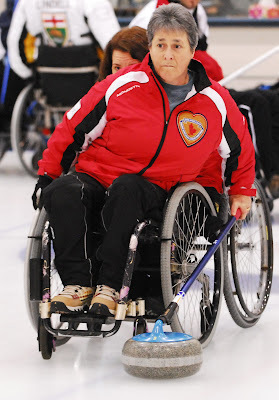 After being passed over in favour of British Columbia-based individuals to represent Canada at the 2010 Paralympics, the long-term goal Paialunga holds is to compete in the 2014 Paralympic Games in Sochi, Russia. “We’ve got another four years to get working on being the best team,” she added. Now she just has to help her team past four other competitors in Ontario's Dominion Provincial Championships at Collingwood CC February 17-20. Team Canada's wheelchair curlers have been part of a top secret research program out of the University of Alberta that has been analysing and subsequently fine tuning delivery motions using computer analysis of high speed photography. Phys. Ed. lecturer Pierre Baudin said that the research on wheelchair curling was significant because it had not been explored before. There's a lot that goes into a successfully thrown stone and certainly a biomechanically efficient delivery is an important element. But so too are being disciplined about where you place the stone, and the chair in relation to the stone, and the broom in relation to the chair and the stone, in addition to being able to regulate the speed of the throw when contact with the stone is measured in fractions of a second. Working out what motions best accommodate a particular wheelchair users muscle set can help, and if the analysis breeds confidence, so much the better. Several people have mentioned to me that from their observation, Team Canada skip Jim Armstrong is carrying the injury to his non-throwing shoulder with obvious discomfort. While there has been no official comment from the team, my understanding is that the injury is uncomfortable, and does affect his mobility, but is not expected to be an issue as far as playing is concerned. Jim is fortunate in that he can use his legs in addition to or in place of his non-throwing arm, to brace his delivery. Experienced users of manual wheelchairs know what a strain is placed on shoulders. Throwing rocks from a chair compounds that strain. So it is no great surprise that Jim, with body already worn from decades of sweeping, may be feeling pain, particularly if he felt the need to play catch-up in training after being inactive after last year's shoulder surgery and car accident. Though Canada would prefer a fully fit Armstrong throwing fourth stones, his major contribution to the team is not the ability to throw takeout weight. Were his injury to worsen, they could easily let him skip from lead. Were that to happen though, would they just move Sonja, Ina and Darryl up the order, or would they bring in Bruno at third and sit Sonja? And who would skip were Jim not able to play? Canadians, especially the coaches, hope these questions will never need answers, but what would you do? Newfoundland and Labrador's provincial team will play a series of exhibition games at the Halifax CC this weekend, February 13-14, against Team Nova Scotia. Both teams finished at 3-6 at last year's Nationals in Nova Scotia. Newfoundland and Labrador lost their skip when Chris Daw relocated to Vancouver, so Joanne MacDonald steps up from 3rd and will become the first woman to skip a provincial side. Darlene Jackman, Lanie Woodfine and Felix Green all return from last year's rookie provincial squad. Team Nova Scotia have added Debbie Earle to last year's team, and the exhibitions will be their first opportunity to compete as a provincial unit. Games are at 9am and 1pm on February 13th, and 11am and 3.30pm on the 14th. Team Canada are one of three finalists for the True Sport Foundation's award of Team of the Year, to be presented at the 37th Canadian Sports Awards, March 3rd in Toronto. They are up against the men’s IIHF world championship squad and the national women’s water polo team. It was deja vu all over again in Edmonton and Kenora as Jack Smart and Wayne Ficek successfully defended their Provincial titles. Smart's Calgary rink, with Anne Hibberd and Bridget Wilson maintaining their record of making every Alberta provincial team, beat Edmonton's Cliff Nuspl 11-2, completing a tournament where they averaged 8 point winning margins in their 5 games. It was a much tighter affair in Kenora, where local favourite Ficek faced Thunder Bay's Carl Levesque, 7-4 winner over Dawid in Saturday's semi-final. It was a back and forth game with Levesque stealing an early lead but being held to a single with hammer in the 8th, forcing an extra end. In the extra the play was in the four foot with Ficek second Chester Draper drawing to the top of the 4, and Thunder Bay's Ron Brunelle playing a tap back. Ficek 3rd Mark Wherrett drew to the four foot but Levesque, facing two, put his last rock in the four foot just behind the t-line to sit shot. Ficek with his last rock drew down to it to win by a measurement. Final score 7-6. In Edmonton, Jack Smart finished round robin play with a 13-3 defeat of Edmonton's Donaldson in just 6 ends at the Alberta Provincials. Nuspal beat Keith 12-3 in 7 ends setting up an all Calgary (Smart and Keith) and all Edmonton (Donaldson and Nuspl) semi-final. Both semi-finals ended in early 6th end handshakes, as Smart beat Keith 14-1 and Nuspl beat Donaldson 9-1, setting up a north vs. south final, 12.30pm at the Jasper Place CC. In Kenora, Wayne Ficek beat Richard Dawid 6-3 to advance to Sunday's N. Ontario provincial final against the winner of the Levesque/Dawid semi-final. Results will be posted HERE. Current champion Wayne Ficek took 6 in the 3rd end of a 9-3 victory playing Thunder Bay's Carl Levesque on home ice in the opening draw of the Shoppers Home Healthcare 2010 N. Ontario Championship at the Kenora CC. Levesque had a chance to get back on track in the evening draw, facing fellow Fort William curler Richard Dawid. Steals in end 3, 4 and 5 saw him cruise to a comfortable 11-2 win. In the Alberta Championship at the Jasper Place CC, Edmonton, defending champion Jack Smart beat Edmonton's Nuspl 8-3 in the opening draw, and fellow Calgarian Keith was doubled up by Edmonton's Donaldson 7-14. In Draw 2 it was Smart over Keith 14-2 and Nuspl over Donaldson 8-4. Two teams from Calgary will travel to Edmonton's Jasper Place CC to challenge two Edmonton teams for Alberta's Provincial Championship. Jack Smart's Calgary champions make one forced change. Last year's 5th, Martin Purvis, replaces Bruno Yizek who'll be on Team Canada duty during the Nationals. They'll play with the confidence of knowing that they have represented their province at every national championship, coming within a whisker of gold in 2009. The second Calgary team has Dale Keith at skip, Bruce Matthews at third, with rookies Ron Pawlyk at second, Wanda Pizzinato at lead and Curtis Junor as the alternate. This will be Keith's third appearance at the Provincial Championship, his first as Skip. Matthews is also making his third appearance at this event. 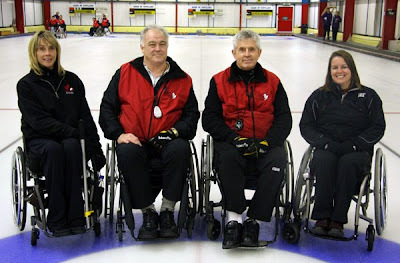 The team is Coached by Glen Brunelle, Coordinator of the Calgary Wheelchair Curling Association. The Shoppers Home Healthcare 2010 N. Ontario Championship sees 2009 champion Wayne Ficek fielding an unchanged team, as his Kenora club hosts Thunder Bay rivals Carl Levesque and Richard Dawid from the Fort William CC. These three teams have just returned from the Ontario Parasport Winter Games, where Levesque took silver and Ficek took bronze. Team USA is based at the Utica CC and works closely with SITRIN (Success Through Adaptive Recreation and Sports) which has joined forces with The Central Association for the Blind and Visually Impaired, and United Cerebral Palsey to raise funds to enable all their patients curl. USA Team Leader Marc DePerno, a SITRIN employee, told the Utica Daily News curling has become a competitive sport for some, but it's also a fun and dynamic rehabilitation tool. "First and foremost," DePerno said, "it's about collaboration -- friendships, getting out and about; adaptive sports provide an avenue for you to improve your quality of life and self esteem, and make friendships. It's a chance to excel in an area of life you didnt realize you could, and when a person comes to try it, they usually get hooked." 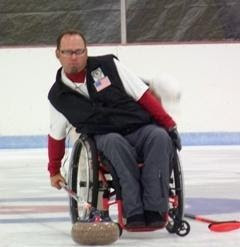 Physically, adaptive curling is excellent, too, DePerno said. "The great thing is, it does not require as much physical mobility as other adaptive sports," DePerno pointed out. 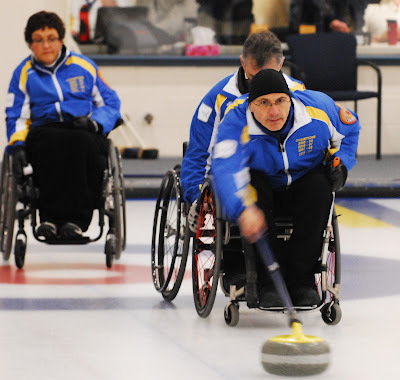 "Curling basically opens the door to a whole other area of disabilities." Californian Patrick McDonald, the only Team USA curler not competing out of the Utica CC, is profiled HERE. What’s the coolest thing about being a Paralympian? “I get to represent our country again,” says the patriot, who served as a Cavalry Scout 19 Delta from 1989 to 1992. 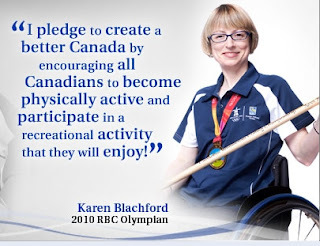 Karen Blachford, a member of the original Team Canada and who retired from the national squad after winning a gold medal at the 2006 Torino Paralympics, has been chosen by the Royal Bank of Canada to be a 2010 Olympian. Their website description of the program: "The RBC Olympians program hires both Canadian Olympic and Paralympic athletes as community ambassadors who bring Olympic messages of excellence and leadership to Canadian communities. Athletes are provided with the opportunity to gain valuable skills that will help them prepare for life after sport, while also receiving much-needed funding to help them realize their Olympic and Paralympic dreams." CLICK HERE for details of her citation.